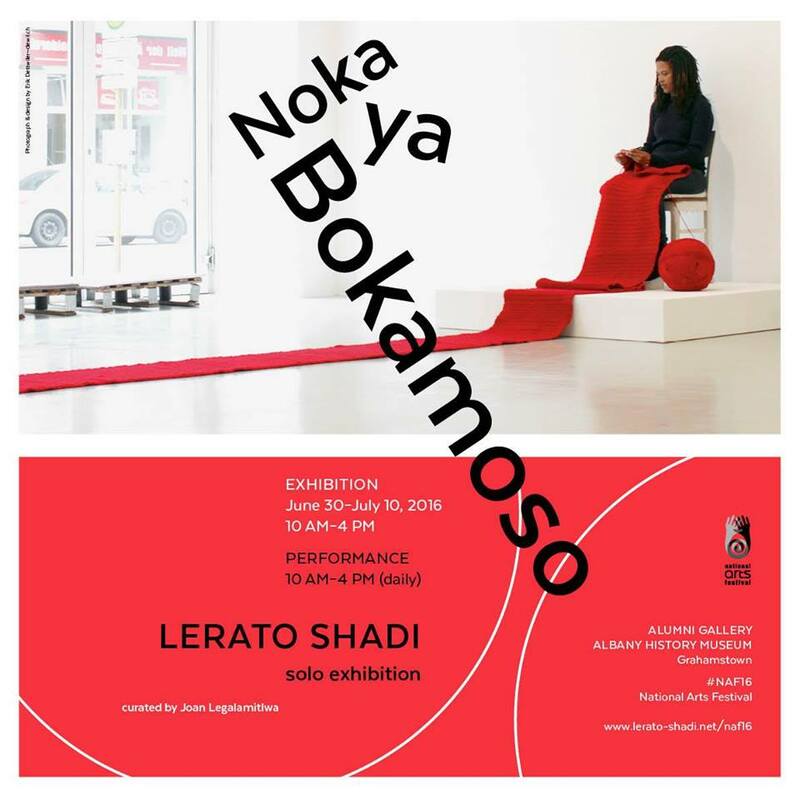 Lerato Shadi invites you to her latest solo exhibition and debut National Arts Festival appearance, Noka Ya Bokamoso. This exhibition by the Mahikeng born, Berlin based video and performance artist is one of the six visual art showcases chosen for the main programme. The exhibition features four of Shadi’s latest works; two performative installations Makhubu and Mosako Wa Nako as well as two video works Sugar & Salt and Untitled. Makhubu is a work performed in the days preceding the festival, executed in absence of an audience. This performance involves Shadi arduously writing in concentric circles with a red pencil, then erasing the writing, leaving traces of the text on the wall and red remnants of the rubber eraser on the floor. This work looks at the historical erasure of the Black subject within the context of Grahamstown’s problematic history as well as historic erasure in the national narrative and how that has impacted on the kinds of stories that we currently tell. The absence of an audience becomes a corporeal metaphor, emphasising the ways in which South Africans, continue to construct a sense of nationhood unaware of significant violent acts that have shaped them. For Mosako Wa Nako, Shadi will be seated one end of the gallery space for an uninterrupted six hours a day, over the eleven days of the Festival, crocheting what looks like be a red woollen carpet. Sugar & Salt, a video work featuring Shadi and her mother consuming a mineral in the form of salt and a carbohydrate in the form of sugar, makes references to the complexities and intricacies of mother-daughter relationships. Untitled, Shadi’s latest video work, having its world premiere at the National Arts Festival, will be shot on location in her home village of Lotlhakane, in June 2016. The work consists of a two channel video work conceptualised in three parts: the first deals with the utmost extremes of individual resistance; the second deals with how Shadi experiences the impact of colonial language; the final part is an allegory of resistance. Shadi’s work explores problematic assumptions projected onto the Black female body and how performance, video and installation create a space for artists to engage with those preconceived notions, making the body both visible and invisible. Using time, repetitive actions as well as stillness, she questions, ‘How does one create oneself?’ rather than allowing others or history to shape one’s person. The key aim of Noka Ya Bokamoso is to re-center Shadi’s works to its primary audience – the South African audience. Shadi has practiced and exhibited in New York, Bern, Dakar, Moscow and Scotland and now seeks to utilise her work to foster and encourage dialogue around questions of historical knowledge production and its inclusion and exclusion of certain subjects. Her ultimate goal is that she, along with her audiences, will be encouraged not only to consume, but consciously engage in the processes of unearthing subsumed histories and producing critical knowledge. Lerato Shadi lives and works in Berlin. She completed a BFA in Fine Art from the University of Johannesburg. She was included in The Generational: ‘Younger Than Jesus’ artists directory published by the New Museum, New York. In 2010 she was awarded a Pro Helvetia residency in Bern. In the same year she had her solo exhibition Mosako Wa Seipone at Goethe on Main in Johannesburg. From 2010 to 2012 she was a member of the Bag Factory artist studios in Johannesburg. In 2012 her work was featured at the Dak’art Biennale in Dakar, Senegal and in the III Moscow International Biennale. She is a fellow of Sommerakademie 2013 (Zentrum Paul Klee) and completed in the same year a residency program by invitation of INIVA at Hospitalfield (supported by ROSL). In 2014 she was awarded with the mart stam studio grant. She is currently completing her MFA at the Kunsthochschule Berlin Weissensee. Noka Ya Bokamoso is made possible through the generous support of the National Arts Festival. This entry was posted in art, embodiment, gender, politics, race, writing and tagged grahamstown, identity, joan legalamitlwa, lerato shadi, narrative, national arts festival, thread. Bookmark the permalink.